Forget the fact that he cut off his own ear. Just remember the sunflowers and the other colourful paintings Vincent Van Gogh did. 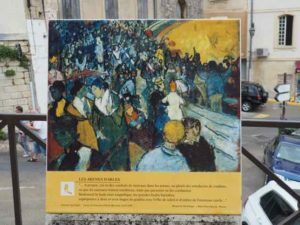 He was a tortured genius and I have learned so much more about the man and artist through the film, “Loving Vincent” and during my visit to two towns in France: Arles and Saint-Remy-de-Provence. 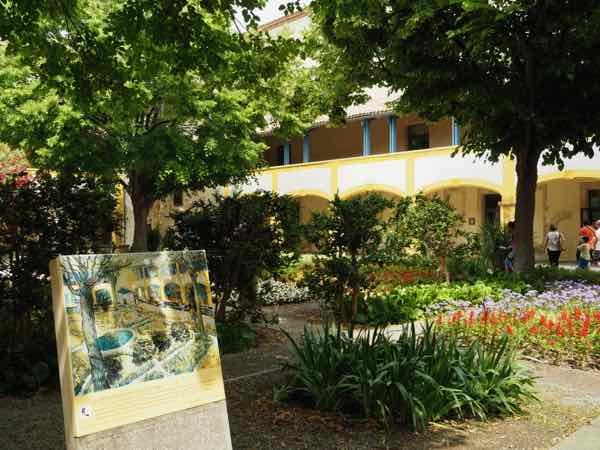 It is in these two towns in particular where you see van Gogh’s paintings come alive in Provence and learn much more about the artist : through the Van Gogh walking route in Arles and the walk from the centre of Saint-Remy to the Saint-Paul asylum (hospital) where Van Gogh admitted himself. Before I get into Van Gogh’s background and the sites in Provence, I thought I’d start off with this quote from Van Gogh which is shown in the movie, “Loving Vincent”. It pretty much sums up how his work affects people today. “Loving Vincent” is the story about painter Vincent Van Gogh but it’s not a usual movie with well known actors. It’s an animated film that is creatively done. The filmmakers wanted to “recreate” Van Gogh’s paintings into film and the process took four years. 65,000 frames were PAINTED in oil paints and these were then transformed into the “world’s first fully painted feature film”. Every second, 12 canvases were shown. 119 of the paintings were on display at the Noordbrabants Museum between October 2017 and January 2018. 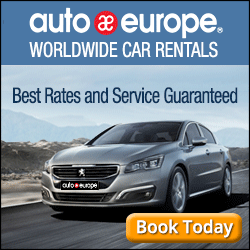 You can now rent the film on iTunes. In this film, a young man attempts to deliver Van Gogh’s last letter to his brother Theo and in the process learns about Van Gogh’s life and death. It’s sad that he never got the recognition for his work while he was alive. In fact, he only sold one painting in his lifetime, the “Red Vineyard at Arles”, which now resides in Moscow (Pushkin Museum of Fine Arts, Moscow). During 8 years of his life, however, he painted over 800 paintings. Vincent Van Gogh was born in 1853 in the Netherlands to a well-to-do Dutch family and religion and art greatly influenced him. His father and grandfather were ministers and three of his brothers were art dealers. When Vincent was 20 he went to work for an art dealer in London, however, after a couple of years he decided he was more interested in religion and returned home, hoping to study theology. He wasn’t successful in pursuing this area of education and ultimately became homeless. He was a lost soul who finally found that he enjoyed drawing people and landscapes. Van Gogh studied in Brussels and then worked in the Netherlands. Initially his paintings were dark—-lots of browns—but then he decided to study colour and for many years continued to develop his drawing and painting skills in Antwerp. During this period he was eating poorly, and drinking and smoking constantly. He had ill health and ongoing arguments with his instructors and at least once was hospitalized before he headed to Paris in 1886. Van Gogh was close to his brother Theo, who was an art dealer and had a gallery in Montmartre. 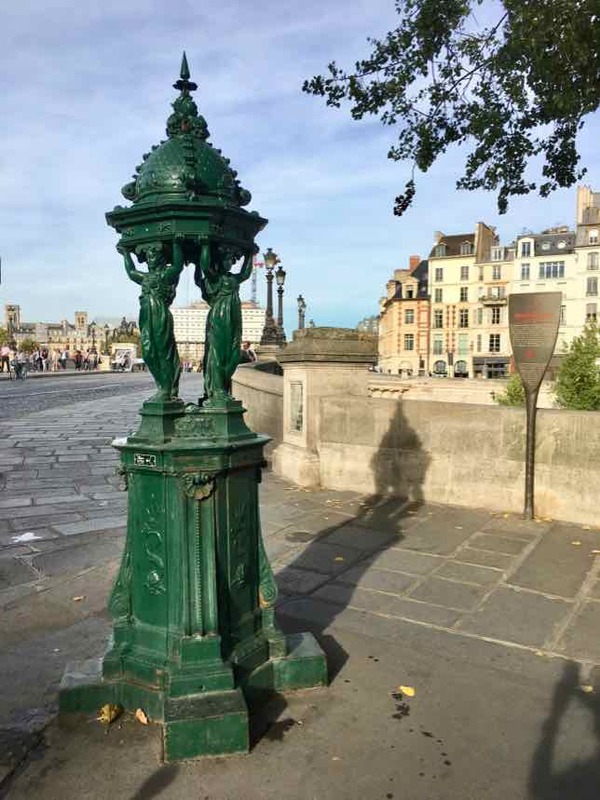 Theo tried to help Vincent with his connections and they befriended Henri de Toulouse-Lautrec, Paul Cezanne, and Paul Gaugin. In 1888 Vincent left Paris, exhausted and wanting to live in the south of France where he could possibly start an art colony. 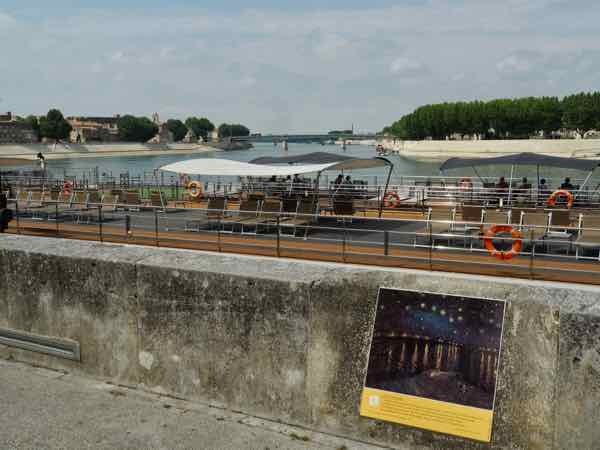 He moved to Arles. In Arles, Vincent loved the landscape and the light. 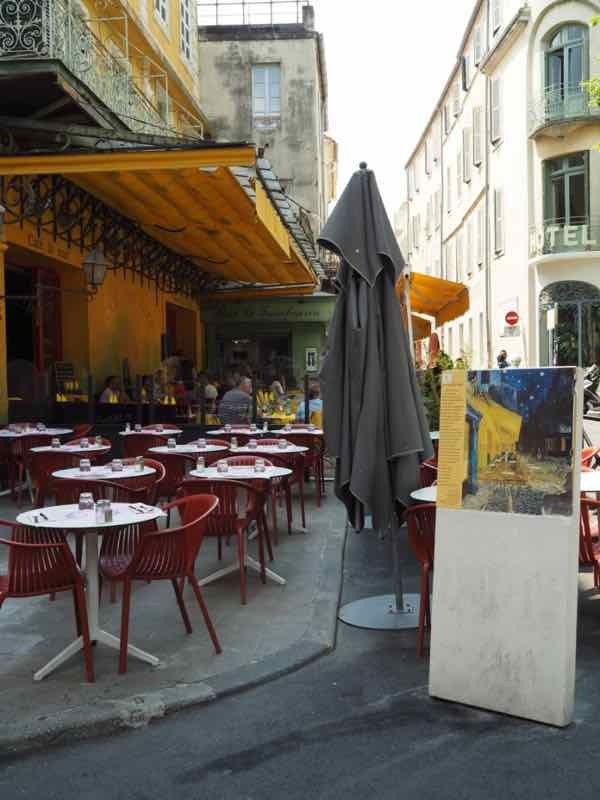 Many of his paintings have hues of yellow and blue and during his time in Arles he completed over 200 paintings. 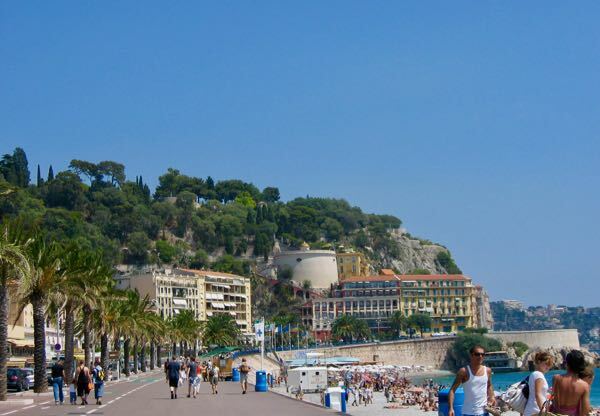 He rented four rooms in the “Yellow House” for 15 francs a month and used part of the house as his studio. He invited his friend, painter Paul Gaugin, to live with him and they painted together for a time; however, they also fought constantly. It is said that as a result of a fight with Gaughin in December 1888, and a mental breakdown, Van Gogh sliced off his ear. He was in and out of the hospital and eventually moved to Saint-Remy-de-Provence, where he entered the Saint-Paul-de-Mausole asylum. 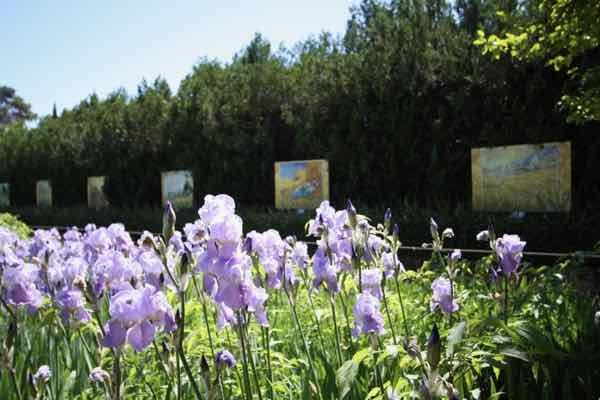 The route that one can follow in Arles takes you to various locations where Van Gogh decided to paint. 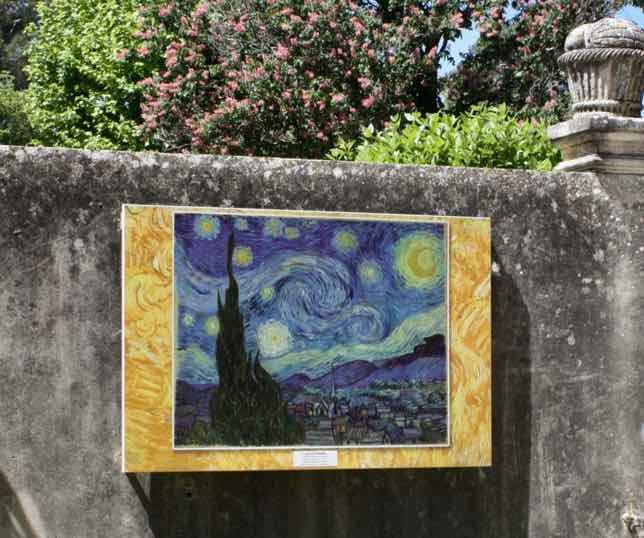 The city has installed panels at each location to show a replica of the painting that Van Gogh created. 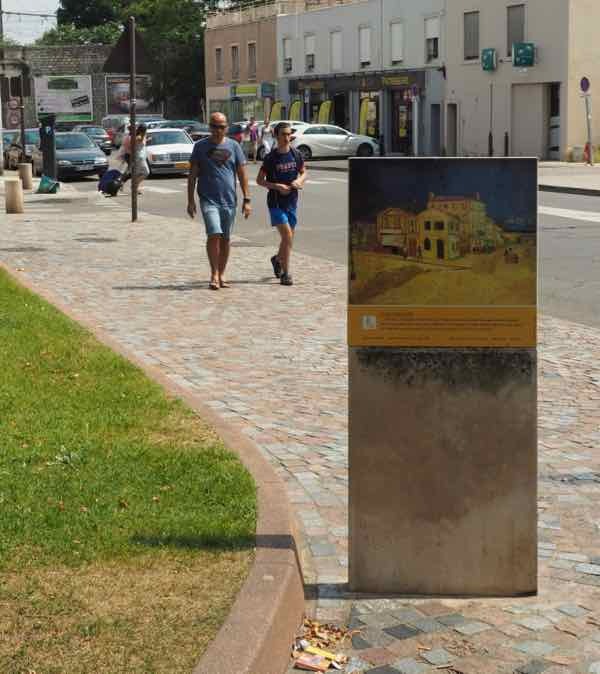 On the ground are markers which help you locate these signposts. It’s wonderful to stand there, in the exact spot that Van Gogh did, and realize that he had a wonderful vision. As you can see in many of these photos, the “real” spot/location just doesn’t compare to the vivid colours that Van Gogh used in his paintings. You can pick up a brochure indicating the locations from the tourist office (1€) or you can download a free copy from the tourist office here, but it really only has 2 pages on the 10 sites as well as a map. 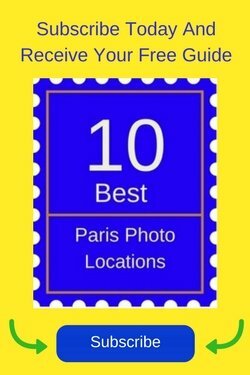 It’s not overly comprehensive and it is in French. This is another night time scene that Van Gogh enjoyed. 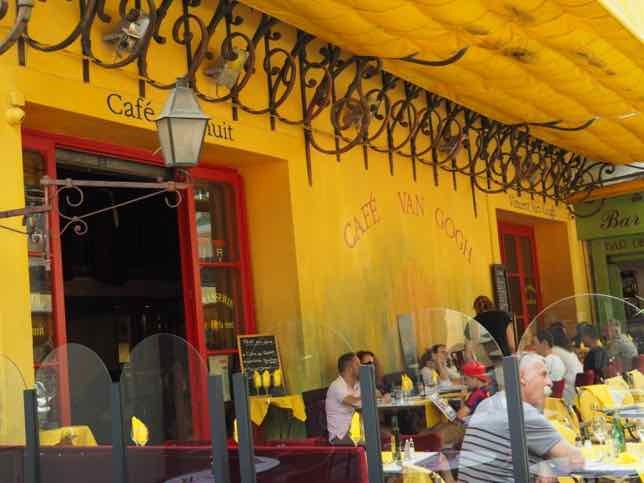 Like Le Cafe Soir, the yellow stars and blue sky are highlighted. It is currently at the Musée d’Orsay in Paris. Les Arènes d’Arles is the focal point in Arles. The amphitheatre was built in 90 AD and used to have gladiators fighting it out as well as chariot races. Today bullfights, concerts, and plays take place here. Soon after this was painted, Van Gogh cut off his ear. One of the theories is that he witnessed a bull fight where the ear is severed from the bull that has lost a competition. 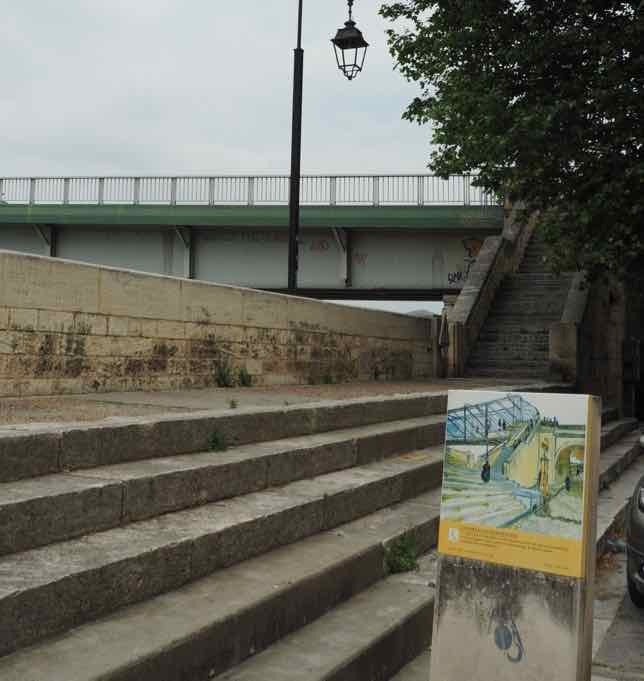 In question is whether this influenced him to do this to his ear as he slowly became more mentally ill.
As you can see, today, the bridge and the walkway are nothing to write home about, but Van Gogh’s painting, with his use of colour make the whole scene much more satisfying to look at. 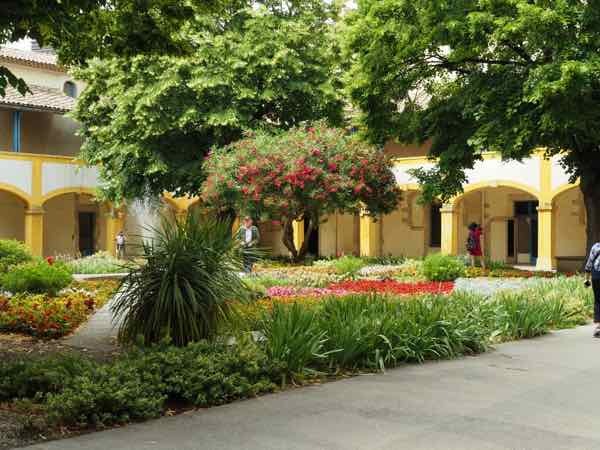 Today the gardens are an oasis from the busy city life of Arles. 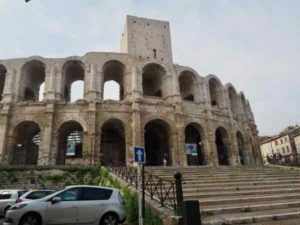 When I was in Arles on a Saturday a very large outdoor market was going on along Boulevard des Lices and Boulevard Georges-Clémenceau. The market runs Wednesdays and Saturdays. The “Yellow House” is gone, a casualty of World War II bombings. 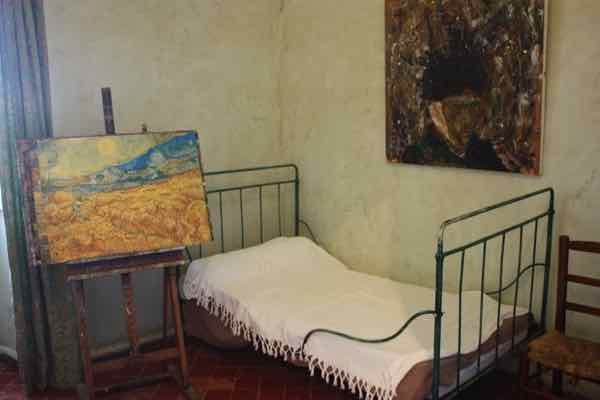 While confined to the Saint-Paul-de-Mausole asylum, Van Gogh did have an art studio there. He continued to paint landscapes, nature scenes, a few portraits, and flowers including The Starry Night and Olive Trees With the Alpilles In The Background which are both at the Museum of Modern Art in New York City. During his year at the hospital, he continued to have mental breakdowns. 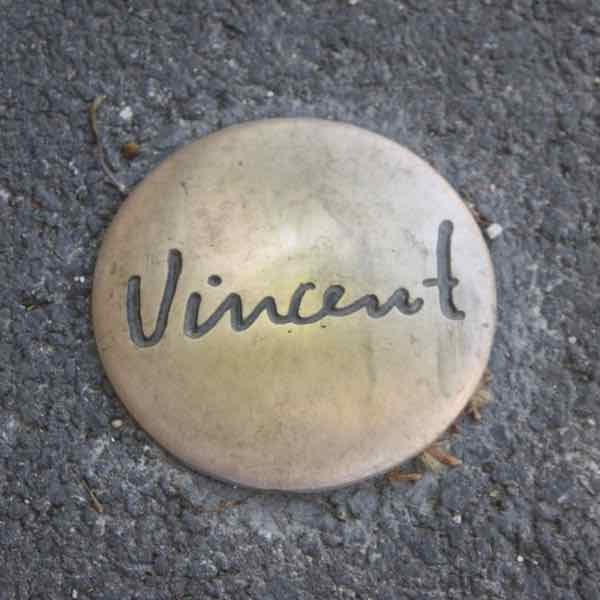 It’s better to walk to the asylum rather than drive the 1 kilometre distance down Avenue Vincent Van Gogh as you will see “Vincent” markers on the ground and panels on the side of the road. These show replicas of his work but are not necessarily where he painted them. Beside each is a quote from a letter Vincent wrote to various individuals such as his mother and brother, Theo. 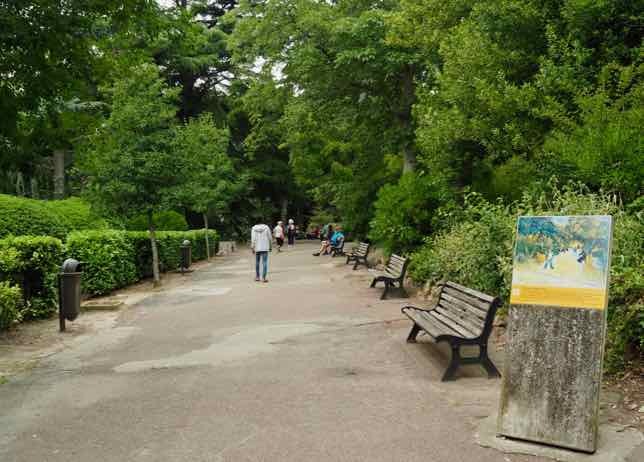 At the asylum, there is a lovely garden, a recreation of Van Gogh’s room and studio and more panels highlighted in the garden. 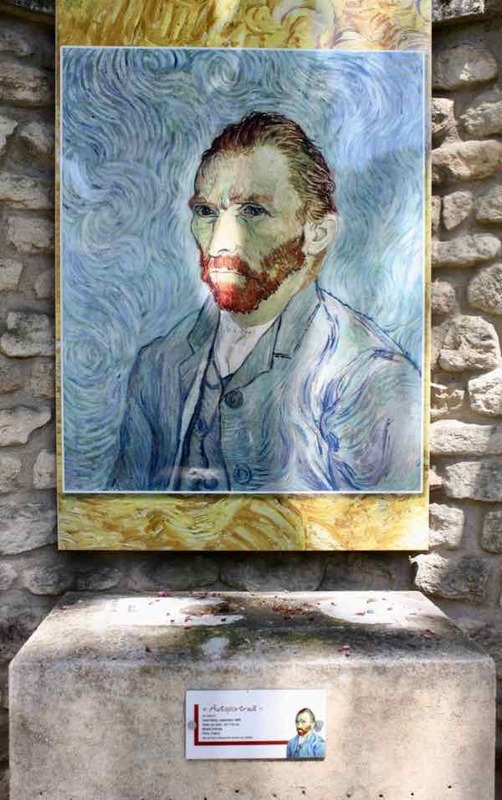 Vincent Van Gogh spent his remaining years in Auvers-sur-Oise, 37 kilometres north of Paris, to be closer to his brother Theo and Dr. Gachet, who was a budding artist and doctor to other artists. In July 1890, Van Gogh shot himself in the stomach and died two days later. Vincent Van Gogh was a post-impressionist painter who lived in poverty and struggled with mental illness. It is not until after he died that he became so famous. There is a helpful website created by the The Gifted Art foundation in conjunction with the Van Gogh Museum in Amsterdam. http://www.vangoghroute.com You will be able to see the various places in Great Britain, The Netherlands, Belgium, and France where Van Gogh lived and worked. 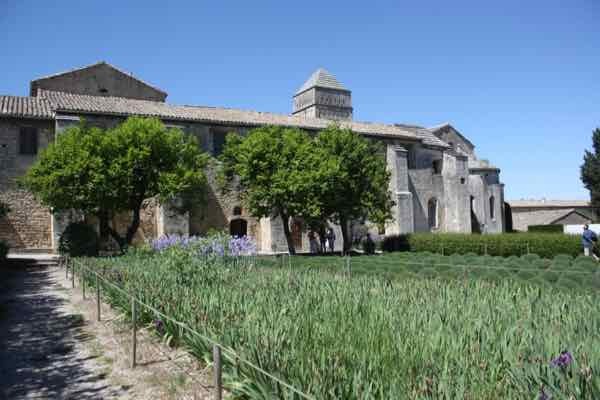 I enjoy the Van Gogh walks and sites in both St.-Rémy and Arles, and especially love the painting Olive Trees With the Alpilles In The Background. It helps me see how Van Gogh distorted real objects, but at the same time allowed us to see them more deeply that we would otherwise. 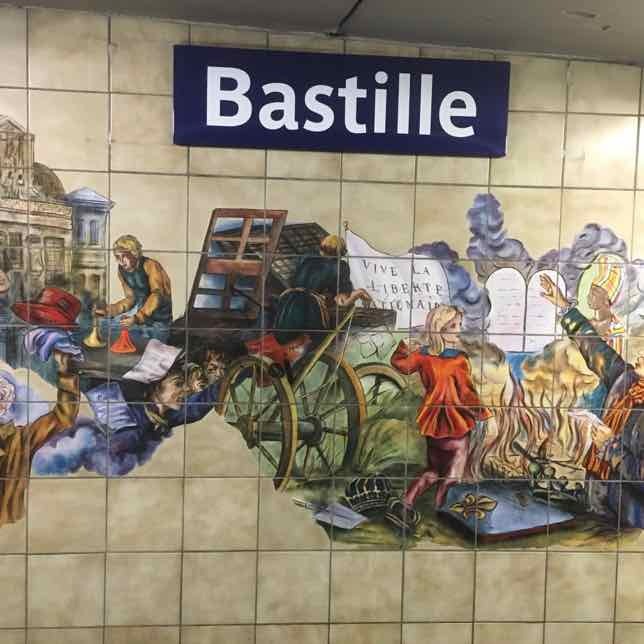 They’re both wonderful places to explore and see how Van Gogh might have seen things. Thank you very much for the tour, Jan. We will be there in a few weeks and your insight is valuable – we will marvel at his work! You’re welcome. 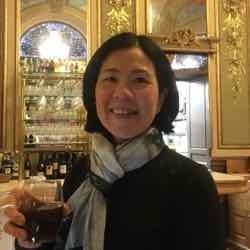 Enjoy your time there!